For a good time, call Terry Pratchett’s Discworld series. The books have been the pinnacle of creative fantasy since The Colour of Magic was released in 1983. Legions of fans sprouted in subsequent decades, gobbling down every word in more than 40 novels, tie-in books, comics, and video games. The invented environment has grown so elaborate, there’s even a series of pseudo-scientific reference works that use a nutty Discworld narrative to explain complex, real world scientific concepts. The first volume, The Science of Discworld, was released last year, and The Globe: Science of Discworld II: The Globe is out tomorrow. Blending science into a world where orangutans can be librarians isn’t as impossible as it may seem, however. Discworld carefully skips along the line between parody and absurdity, and it does it so well, you might start believing there really is a color called octarine. Here are just a few reasons why Discworld is the wildest place ever. The very core of Discworld is a parody on one of our oldest, most cherished, and most outdated ideas. You know how everyone used to think the world was flat and carried through space by a gigantic animal? Well, that actually is Discworld: a flat disc supported by four enormous elephants, perched on the back of an even more enormous turtle. Welcome to the party! When it comes to magic, most fantasy books are all like, “Then he cast a fire spell by saying the magic words and there was fire all over the place because it was magic.” Brandon Sanderson aside, there’s rarely a deeper explanation for what magic is, why it exists, or how it works. It’s just there and it makes magical things happen, so smile, and enjoy your fantasy book. In Discworld, everything exists inside of a standing field of magic that’s kind of like our electromagnetic field. Only, you know, not as science-y sounding. The field warps reality, so the more concentrated the background magic is in an area, the less static reality has a chance to push through. This creates pockets of, well, weirdness. For example, if you strolled into one of these less-than-real areas, you might not stroll out as a member of the same species. Or even crazier, you might find yourself wearing a hat that just doesn’t suit you. Magic users must tap into this field to cast spells, but it’s not as simple as uttering special words from beneath your beard. Using magic is the equivalent of telling the universe what to do using a language it can’t ignore. Remember that time we split the atom? Discworld magic is closer to that than waving a wand. The Law of Conservation of Reality states it takes the same amount of effort to do something with magic as it does to do it without. Why bother toying with the infinite unknown of the universe when you can just get up and do the dishes yourself? Now we’re getting to the juicy stuff! One of the most powerful forces in Discworld is narrative causality. Put simply, it means nothing can exist unless there’s a narrative reason for it to exist, even if it doesn’t strictly make logical, sequential sense. As long as the end purpose is justified, the universe isn’t perturbed if something crazy manifests. Dragons breathe fire because that’s what everyone expects them to do. They didn’t evolve the ability, they don’t have ovens in their guts, they just do it. Narrative causality makes all sorts of wild things to happen on Discworld. Ever notice how the unlikely hero is always the one who saves the world? On Discworld, unlikely heroes aren’t so unlikely, since that’s what most people expect. If a story is told often enough and believed by enough people, it becomes true. A million-to-one shot is nearly a sure thing, because in stories, it’s always the million-to-one shot that saves the day. That reminds me of the time I found a vein of gold in my backyard and became a millionaire overnight. Tell your friends! The pantheon on Discworld started as a parody of our Greek gods. Thanks to narrative causality, they’re now an unwieldy mess of names and changing professions. The major gods usually stick to their mountain upon high, pausing only to toss the occasional lightning bolt at sentients down below. But the minor gods? They’re everywhere. Literally, everywhere. The moment any event occurs, no matter how small and insignificant, a god is manifested to rule over that event. Remember when you sneezed on your toast but ate it anyway? A god was born. The catch is these small gods rarely amount to anything. In order to gain power, they have to attract believers. Since nobody really cares about you or your toast, that poor god isn’t long for his or her manifest existence. New gods appear and disappear on a regular basis in Discworld. Old ones even change jobs as people’s belief systems shift over time. For example, Anoia used to be a volcano goddess. Now she eats corkscrews and is known as the Goddess of Things That Get Stuck in Drawers. The good kind of insane. When you join Discworld fandom, you’re in good company: These creative humans are rabid about all things Discworld, and they’re always eager to help you along on the way to your own addiction. They play Discworld video games, shop at the brick and mortar Discworld Emporium, indulge in Discworld cosplay, and so much more. 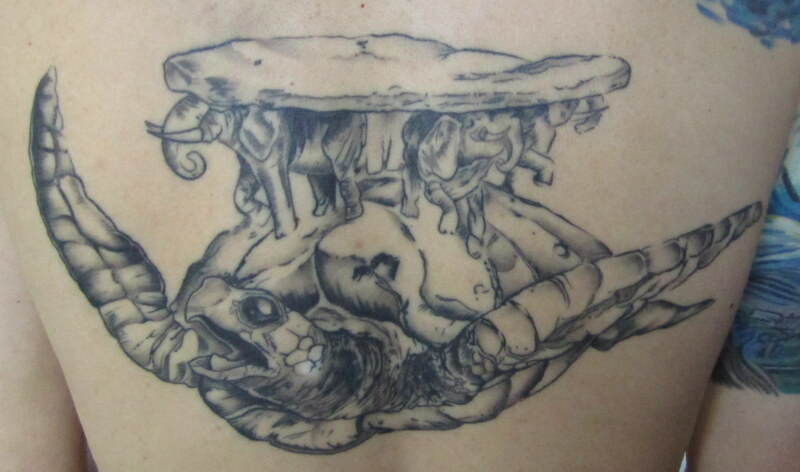 You can even sip a Discworld beer and munch on a slice of Discworld cake while waiting in line to get a tattoo of A’Tuin across your back. What’s your favorite Discworld novel?